Marie and Josh are great. Their house is set back on an amazing piece of property, I mean just look at that backyard! Josh helped me put up the bay window valance even though I desperately wanted to put it up myself and make them walk into their kitchen HGTV surprise style. They are the best sports ever, I hope to work with them again. Despite the intimidation of scallops below are simple instructions that should take the fear out of approaching a scalloped sewing project, and you can see how easy this look comes together. Deterimine the height of your valance and add 2 inches. These valances were to be 18" when finished so I cut 20" strips. Cut your strips being cognoscente of the pattern repeat. Meaning if you need to join more than one width together you'll need to cut it at the repeat, so if the repeat is 27", cut 27" strips even if you only need 20", you'll have to waste the other 7" inches. If your valances will require more than 54" inches in width, join the strips, matching the pattern if need be, to get the size widths you need. I was making three valances one was 60" finished, 80" finished, and 128" finished. 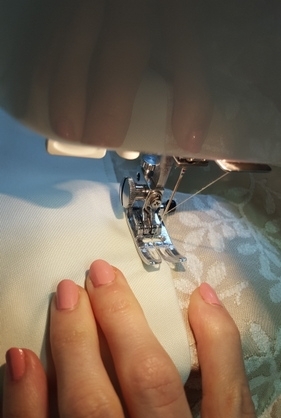 Take the time to make you scallop template, out of tissue or another fabric. Taking into account where the peaks of the scallops will fall. You may want to custom cut the scallops to really fit the space you are making it for. I decided an 11" scallop repeat would work for the space I was working with. I started from the middle of each valance and worked my way out. By folding the whole length of the panel in half and placing your template from the fold outward to the end of the length you'll ensure your scallop's symmetry. I add 1 1/2" to the length needed that will be folded back to form a clean side so cut the 1 1/2" flush with the part of the scallop you end. Next cut strips of lining. I like to use blackout lining for valances. so I cut strips of 20" blackout and pinned right sides together. Then stitched with a 5/8th seam allowance along the scalloped edge. at the edges fold back the lining and the feature fabric an 1 1/2"
Then I cut off the excess lining so the blackout lining and scallops were the same shape, you could have done this prior to stitching the layers together but I find it easier to do so after stitching. Then clip clip clip all those curves. When folded the understitching should see to it that the lining pulls to the underside an the scallops should now lay flat, that ever important clipping made that work. The lining is now 1" smaller than the feature fabric stitch the top together with a 5/8th seam allowance. Now turn the whole valance right side out. Split the difference between the top and the hem so you see a bit of feature fabric at the top and bottom on the back side. Pin all over so it stays in place while you straight stitch the rod pocket. I was so excited when my friend Danielle asked me to work on a valance for her kitchen. Danielle has great style and I knew I was going to love working on her project! She recently updated her kitchen and got NEW WINDOWS!!! It was time to put down some serious game when it came to her new window treatment. Here is what we came up with :) And you can read all about how this look came together! I used three fabrics. Sunbrella Vellum for the lack lining. Sunbrella fabrics are amazing! They are moisture, sun, and stain repellent.The feature fabric was the Iman Plantation fabric. Then sandwiched in between these two fabrics I put a layer of black out. Black out, on it's own, would have been a great lining, but since the valance was not very big instead of adding a hidden pocket for the rod, I just used three entire layers, as you'll see. For a rod I used a 2 1/2" Dauphine Pocket rod. And last but not least some great premium tri-color twisted cord for the trim. Then using tissue I played around until I got the shape just right. Bonus I could see the exact pattern in the fabric through the tissue. Then I pinned the cord in place. Cord has a bit of stretch to it so it is best to pin in place before baste stitching, especially with all the curves in this valance. Here in this photo you see the black out fabric. I basted together the blackout, feature fabric, and the cord. Then I pinned the Subrella backing and the feature fabric right sides together. Next I got out my piping/cording foot to attach the cord. Here you see how easily the piping foot neatly and precisely attaches the cord. Then it was time to clip all those curves! Clip Clip CLIP! After I was done clipping I under-stitched all of the seam allowances to the back liner. This helps the valance lay flat and helps the cord lay forward. Then it was time to create the pocket and stitch on the cord to the top. Keeping the feature fabric out of the way I used the blackout and the Subrella backer to form the pocket. I was able to draw a line right on to the blackout liner. Then I attached the cord to the top, stitching it to the feature fabric and the blackout. And folded the cord and feature fabric down and the Sunbrella down so they met at the cord. I hand stitched them all together at to top. I did the same at the sides. Forgive me for not having a photo! After installing the rod with here is the result!